Reunion, Refreshment, Realisation & Rejuvenation. Flew to Brazil for a week to go and visit my friends and family I’d last seen 10 years ago when i spent a year as a Rotary Exchange student in Brazil. It was the most unbelievable and extremely special week filled with floods of memories, delicious Brazillian food, many smiles and a healthy reminder that things don’t change when they don’t need to. Brazil is an exhilarating country filled with some of my favourite people in the world, whom i will eternally adore and never be able to forget. In 2000 I spent a year in Brazil as a Rotary Exchange Student. I had wanted to be posh and go to a First World Country like France. I dreamed of learning a beautiful language and coming home with an understanding of their particularity romantic language. I wanted to develop an appreciation for finer things like art, fashion, coffee. However after the long interview process (during which I said SA has a population of 10 000 – as that sounded a lot to me at the age of 18) Rotary assigned us to the countries that they felt best suited our personalities. I received the big announcement that I had been accepted to go on a Rotary exchange and would be sent to Brazil. That had me wondering what that said about me as a person? Was I REALLY a third world, Portuguese speaking, coffee drinking, street walking, bus taking, kind of a girl? Surely France and its splendour would have been far better suited to the personality I wanted them to think I had. However, turns out they knew me far better than I knew myself as I ended up loving all those very things about Brazil during my year living there, and so much more. I can clearly remember every detail of that first overseas trip. Proudly wearing my Rotary blazer that in a few months would be filled with memories, mementos and gifts from new friends I’d make from around the world. I remember saying goodbye to my parents, knowing what losing a second child from their home in a short period of time would mean. Leaving Amber and wondering how she would survive. Leaving my high school boyfriend with the promise that I would write letters and send postcards. The Internet was still using dial up in SA at the time. I arrived in Sao Paulo, the largest city I had ever seen with its then 10 million people. I felt quite relieved and lucky to be catching a connecting flight to Rio. I remembered my walk through the terminal gates, like it was yesterday. I was so tense, excited, nervous and had been motion sick just minutes before meeting my host family. Fortunately after a warm welcome and an overwhelming sense of excitement I was ready for an adventure of a lifetime. As my new host family drove me through Rio speaking Portuguese to each other I don’t think I closed my mouth (no not talking for a change) as I marvelled at the magnitude and splendour of Rio. I stared at this real city and fell in love with the excitement of the possibility of the year to come. In retrospect, as an 18 year old leaving Springs (i only moved to Johannesburg when I went to University) Rio was the first city outside of SA I had ever seen. It was no wonder that it had such an impact on my life. The first night I never closed my eyes as I was not used to hearing city traffic outside my window and I had no clue what to expect when morning would come as to the routines these people from across the world might enforce on my life. After several weeks of adjustment, acceptance, realisation and Portuguese lessons I eventually adapted my life, gave in to many changes and accepted my new home. Something, for so many reasons I really did not enjoy to start with. Now I know how much I hate change, hate to be without my friends, my phone and my sense of independence. However I eventually found all these things in my New Home and settled into my host families’ routine and made wonderful friends. I spent 3 months with the Escocard family travelling between our city, Campos dos Goytacazes (i think it took me 6 months to learn to spell the name, never mind pronounce it) and Atafona, a beach town where they had a holiday home. I arrived in January so until Carnival, Brazilians spend as much time on the beach as they do at work, happily balancing their lives and squeezing every piece of life, out of life. Shame, my unfortunate first host family had to spend their summer putting up with me learning the basics of how to say good morning, apple and bathroom. They had to dry my tears several times a day as all I’d wanted to do was return home to my familiar little world where I’d felt protected and wasn’t on show 24/7. They had to explain that Brazil was not a complete 3rd world dump which I was not convinced about, when there were horses on the sand roads, no proper malls, telephone lines everywhere, unpasteurised milk and crazy samba music playing in the people filled streets all night long. They had to teach me to stay awake till 12pm and then go out and try to have a personality as that was when their towns came alive. They had to teach me to eat mayonnaise on pizza, eat pork and beef and chicken together and the worse of all I had to accept the pure violation of being forced to wear a Brazilian bikini resulting in my crying in the change room in horror at seeing so much of my skin sprawled out all over the place. A lesson always learned in looking backwards is that time is the best healer of all things. As now none of these things would concern me in the least. My second host family was my beautiful and always happy mom Eliane, an 83 year old gran Iracema and 3 brothers: Leo 10, Fred 17 and Victor 21. Leo and Fred were and are exceptionally smart, eccentric kids and Victor has Williamson disease and so has the capacity of a much younger child. Moving into this busy home was interesting as there were maids and dogs running around, phones ringing, Eliane rushing off to her several jobs always late, kids everywhere, TV’s and loud music blaring, and even a pet rooster thrown into the mix. Something about the craziness made me realise I was home and so I never even found out who my 2nd and 3rd families that I was meant to stay with were, as there was no chance I was leaving my new family. It truly did become my home. I loved Eliane like a parent and I fought with my brothers like I would have with my own brother. I got moaned at by my gran for arriving home at 5am and waking everyone up when I’d forgotten my keys and I shared in all the real and true happiness and sorrows of life with their family. Living there I was able to shed a skin. The one we get given and take upon ourselves as we grow up at school. The one that says who we should be rather than who we are and the one we forget we can always own. Living in Brazil I was free to be whoever I wanted to be. No matter how loud and outgoing I was, I was still considered calm and conservative compared to the Brazilian’s. I adopted their energy, vitality and passion for life. Their innocence in the fun they have and the beauty in their difficult way of life. Learning that it’s what you make of what you have that’s more important than what it is you have. I spent a year surrounding myself with people that wake up smiling and sing and dance as often as they can. So many of the cultural, social and economic differences between South Africa and Brazil that had shocked me at first, seemed to fade over time. As I settled into their way of life and I let go of my calculated expectations, I began to see the beauty amongst the differences. I was reminded of these stark differences going back to Brazil, 10 years later. So again I had to remind myself to focus on the beauty and look for the good, as then the bad fades away. For I know now that if one focus long enough on anything, the obstacles around it will fade with time. So that’s the intro to the story I actually want to write… That is the background that formed the base for the person who returned home in 2001 ready to further my studies at University. That was also the base for my wardrobe and music choices. That was the base for the way I know I wanted to be and the base that I always try to go back to in my mind when I feel I lose my way a little bit as that was the best me I could ever wish to be. So since my year in living in Brazil, 10 years have gone by. From the age of 20 to 30 quite a lot happens. These have been undoubtedly the best years of my life but also the most challenging, at times heartbreaking but always adventurous. For a few moments on our birthdays we all look back over the last year, comment on how fast it has gone and hopefully have a few positive things to say about the progress we’ve all made in our lives. However arriving home to Brazil I had to reflect and give a summary about the last 10 years of my life and sum it up in a few key events. An interesting challenge with some reflective results. So why return to Brazil, to an almost forgotten life lived 10 years before? Well something for the longest time has been calling me back to South America. When I gave it some thought I realised that I really want to go to Peru to visit Machu Picchu. I also believed that the only way to experience this mighty 7th wonder of the world would be to walk the Inca Trail. I still have no clue why this became a burning passion for me but it became something I was certain I needed to do and I knew I had to do it alone. These reasons I’ll explain later when I write about my adventure in Peru. When booking flights I realised I could fly via the UK and see my family or via Brazil. I debated this for ages as the thought of returning home to Brazil terrified me as all the unknowns and what if’s entered my mind. I loved the view I had and the memories I owned and didn’t know whether I could bare them being proven to be any less if I had to return. What if that year had not been real? What if the people i’d loved didn’t remember me? What if Pao de queijo wasn’t my favourite food anymore? What if Brazil was just a normal country and no longer held the magic for me that it always has? What if my role model Eliane didn’t love me like her real daughter anymore? What if Vitinho didn’t remember his sister? What if my perfect picture was no longer perfect? In the last 10 years I had only seen Tiago and my brother Fred so I wondered what it would be like to see the changed lives of everyone else I loved. Nix, my eternal source of wisdom had simply put it that obviously I needed to return home as I was now ready too. So I did. I set off on my little journey of 11 flights in 3 weeks allll by myselllllf (ok will leave that one to Celine Dion to sing). I arrived in Sao Paulo, now with almost 12 million people and I couldn’t get the smile off my face. It is the most dreadful Airport but before I even bothered to check in on my connecting flight I sat at a little coffee shop with all my bags and ordered my favourite snacks of Pao de queijo, an Ovalmatine chocolate milkshake, Guarana and Pao de batata. I ordered in Portuguese and from some hidden place I heard words come out my mouth that I hadn’t spoken in ten years. This continued to happen and by the time I left Brazil a few days later I had remembered enough Portuguese to hold an average conversation. I sat at this little coffee shop and just observed. I knew without any doubt I was home and thrilled to be there. The Brazilians carry themselves as if they know a secret. They have ballerina postures and dress like tarty air hostesses – always glamorous with the perfect amount of sexiness. All the women flaunted high heels and long dangly earrings underneath their manes of long dark hair. Brazilians must be a hairdressers dream as all of them are just born with three times more hair than the rest of us. The people in Brazil are warm and lovely, although I suppose it’s easier to be nice when you know you’re born better looking and have better weather than anyone from anywhere else in the world. The women are still far better looking than the men and I noticed this hadn’t changed. I left to fly to Rio to see my family. I instantly felt more awake, more alive, inspired and like I needed to correct my posture and change my outfit and shoes immediately. Arriving in Rio I was greeted by my Brazilian mother Eliane and my once chubby, but now tall and good looking brother Leo the Science boff. They were kitted with their cameras and showered me immediately in love and chocolate. It was so awesome and I welled with emotion from the time I arrived in Brazil until long after I left. On arrival at our redecorated apartment in Rio I was excited to find my pet fish cushion has survived. Their plans were to drop me off to sleep but on hearing that they were off to a Supermarket I jumped in the shower and by 23:30 (or actually 04:30 my time) was ready to join them. No shopping opportunity could be missed! Just a trip to the grocery store is like watching a ramp of models – well in my perception of Brazil anyway. Driving around the city there were people jogging and playing soccer on the Copacabana beach at 12pm. Corcovado, the Christ Statue which is quintessentially Rio de Janeiro, with its outstretched arms embracing the city stands 710m high, above the Tijuca forest. The statue itself is 38m (smaller than the statue of Liberty which is 46m). It gleamed above this spotless, humid, green city. I felt a sense of belonging. Not because I did. But because I wanted to. My few days in Brazil were shared between Rio and Campos dos Goytacazes. I could hardly sleep the entire time I was in Brazil as I just wanted to literally jump up and down and run in circles I was so excited. I didn’t want to miss a single moment and was the first to awake and last to go to sleep on most days. Day one I woke up about 4 hours before my family and had a large breakfast of about 12 different kinds of cheese ready and waiting for them, as after all I was family and not a guest, plus I still remembered where to find everything in the kitchen. I was there over Easter which was a bonus as Brazil has the best and largest Easter eggs. Easter time also meant many people were travelling and so a 2 hour journey to the beach town of Buzios took us 6 hours. At one point we did 50km in 3 hours. We spent an evening in Buzios on route home to Campos. It has grown from a quaint beach town to a crowded metropolis. It has certainly lost some of its small town, boutique type charm but its beauty remains and so I was thrilled to return there. I bought a Brazilian bikini as it was obviously the right thing to do and Leo and I shared some fried sushi. The whirlwind visit took me straight back into the homes and lives I’d left 10 years ago. I reunited with everyone whom I had been close to all those years before, with the exception of only two people who I missed. Ligia my Rotary counsellor, Portuguese teacher and friend and then Sarah who was one of my closest friends in Brazil. Somehow everyone else knew I was coming to town and made an effort to see me, in some cases travelling far which astounded me. I saw my now 98 year old gran who looks exactly the same and is just a little harder at hearing. 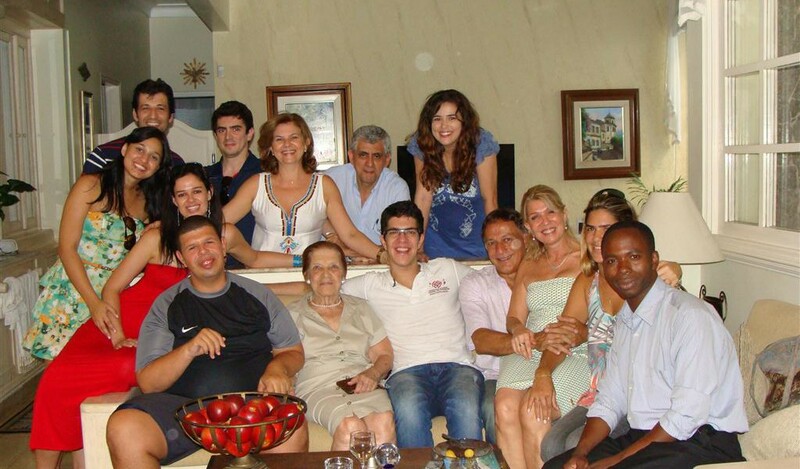 Eliane my Brazilian mom and role model is even more beautiful 10 years later. She looks about 25 years younger than her actual age and acts about 45 years younger. She is dynamic, caring, real, grounded, sincere, easy to make laugh, loving and chooses to always and only see the good. I watched her laugh during awkward and unpleasant situations when anyone else would have wanted to die of embarrassment and take pity on themselves. I watched her pull a strong minded family together in the gentlest of ways. I watched her brighten a room just by stepping into it and I watched myself try to walk in her shoes as much as I possibly could. Trying to absorb like a sponge anything I could drain from her and incorporate into my own life as she is truly my idol and the most phenomenal woman. Oprah should give her a car or send her on a holiday somewhere just for being who she is. A true highlight was seeing Vitinho my brother. He’s always held such a special place in my heart as he is so much more than a normal boy. He recognised me and had been waiting for my arrival. His first words were ‘Te amor meu irma’ meaning I love you my sister and he held my hand and stroked his chest. My eyes welled up with tears as he was exactly how I’d left him, happy, unaware what he is missing as the rest of us lead normal lives, full of love, still obsessed with the colour red, gorillas and car magazines. We followed each other around not wanting to miss out on a single thing and he got upset and jealous if I spoke to other people. He is adorable and I love him with all my heart. My other brother Leo was the biggest change I saw in Brazil. This brilliant, intelligent and fiercely independent man now, was no longer my cute little brother I could boot out my bedroom and yell at for stealing my chocolates. Now he was a leader and working towards living and studying in France. He lives in Sao Paulo, listens to awesome music we both love and cares for people in the most intriguing way. Besides being an awesome friend I truly see him, Vitinho and Fred as my brothers and I am blessed for having such a large and awesome family. I attended a traditional Brazilian feast at my lovely first family’s home where all my friends were invited and I was showered in gifts and talk of memories over delicious Brazillian food. The Escocards are a warm, generous, always interested, close knit family. They have done some home renovations from when I was last there and still cook the best food. They have photos of me in their home which amazed me and each room presented me with a host of memories I’d long since forgotten. Bruce is our new dog. Gabriel (1st host brother) is now a doctor and dating a lovely girl. Beautiful Maria Rachel (1st host sister) is a psychologist dating a pilot and lives in Buzios. Tanya (my 1st host mom) does not speak any English. She is still a warm, stylish socialite and does not have an extra wrinkle or kilogram of weight since in ten years. Mauricio (1st host dad) is still working as a psychologist, is full of wisdom, showers me in brilliant questions and is a great dad and husband to his family. I have always had so much respect for him. A friend who joined us for the afternoon was Domingus. He is an English teacher in Brazil and is initially from Angola. He adores me far more that I can understand why and we had such lovely and inspired conversations. He reminded me that blessings can come from the most unlikely sources if you are just open to giving and receiving them. I received a surprise visit from Tiago. After an unpleasant break up where I was completely horrible I found my heart beating extra fast as he presented himself at my family’s gate, to my amazement. He arrived also feeling nervous but within minutes we were catching up like old friends. He’s spent the last 3 years in Portugal working and studying for his masters and now he’s off to New York next year to do his Doctorate in Engineering. It was very special as he looked at me in the same way he’s always done before, but this time with a completely different understanding. We left better and happier people for our encounter and I learned several lessons in one very blessed, emotionally charged afternoon. I love the Brazilian pace, although I’ll never quite understand it. There seems to be no such thing as social time keeping. 1pm lunch means live your life and get there whenever your life allows you to. Nobody says sorry for being late as they all are, and those early, are content to be. Several trips to the store a day are no inconvenience and there is no stress when after just returning home for the third time in a day, I ask Eliane at 9pm to drop me off across town to quickly visit a friend. Amazing! My crazy, loud, outgoing friend Ana Paula whom I met when I used to attend Cefet School in Brazil is now married to an equally crazy, good looking model named Alan. She got married with pink hair, surrounded by balloons with a performing transvestite and stick on moustaches for her guests. They now live in a pink and blue home covered in more collectable toys than you’d find in Toys’-R-Us. She has a few hundred ‘My little ponies’, yellow ducks around her bath, 6 cats and uses a bed as a couch – just brilliant! They are both designers and such a well suited, adorable couple. When I arrived at their house to visit them, Ana Paula jumped up and down for 10 minutes screaming with excitement and then rushed me inside to see where my photo was on their TV cabinet. This couple are the embodiment of a quote from a book Eliane and I discussed which says, “imagine who we would be if we were not afraid”. This played over in my mind repeatedly as I saw Ana Paula and Alan and realised the miracle that they’ve found the uniqueness they need, in each other, by not confirming and staying true to themselves. I saw other old school friends Andre, Rogerio, Livia, Fatima and their partners in Rio at a cosmopolitan little bar on Copacabana beach front called Mud Bug for Caiperinhas. None of them were married just yet but they all seem set for it in the near future, which is lovely. It was like I’d seen them the week before, except now they were more settled in their defined careers and living slightly further apart. Other than that no obvious changes at all. Same temperaments, same outlooks and same certainty of who they are. I loved this and I think it says a lot about people when they can remain on a path without needing to chop and change identities, because it was the right path to be on all along. A general comment they made which has not left my thoughts was how much South Africans socialise and drink, led by their observations from my Facebook photos over the years. Having returned to SA and become more aware of this fact now, this has been quite an interesting cultural insight I hadn’t really noticed before and taken for granted. I guess South Africans are social by nature as our climate lends itself to it however life stage must surely play the largest role. We did so much in the few days I was there and so when I awoke at 3am to go to the airport to fly to Peru I felt ready to go home to SA as the trip had already fulfilled enough of me. I was returning with 7 pairs of Brazilian shoes, several boxes of their delicious chocolates, hundreds of photos and a heart that had been topped up and renewed. Brazil is like a well of awesomeness to me. Its streets are filled with memories of Samba dancing, laughter and it’s air fills the lungs of a nation that don’t realise how completely unique and spirited they are. Their beaches are filled with energetic brown bodies and their dreadful single lane main roads all lead to a country that is dynamic, passionate and always on the go. In visiting everyone and being so warmly received the very first question from either side was, “so what have you been doing for the last 10 years?” My answer seemed to evolve over the days I was there as it’s quite difficult to summarise every key memory or defining event into a few sentences. I realised in my descriptions how key relationships are in defining and shaping who we become, as most of my answers to that question were around the people in my life. Listening to their stories when I asked them the same question, I realised 2 things. Firstly, the core of people does not change, only circumstances, events and outlooks evolve. Then due to the fact that we keep our lives so busy we assume we are achieving a lot and that we are going somewhere at pace. However, our lives are a lot more regular than we think they are and the things we think define us and we spend our time on (like a career), often aren’t the things that will actually define us in the end. As my Brazilian trip came to an end, I left feeling like a daughter and a friend that had returned home after 10 years. The smile on my face I’d worn like a tattoo for the entire trip fiercely changed into crocodile tears as I sobbed saying goodbye to Eliane and Vitinho at the airport. Who knows when I will return to my other life in Brazil again? I do have the certainty that I can return anytime in the faith that when something is real, it remains. I returned home knowing that the Lord has blessed my life and that in giving, you only truly receive. I am reminded that we get to wake up and choose every single day who we want the world to see. It is up to us to make dreams and real life come true. I wish for everyone I love that they can find their Brazil. Their source of hope and inspiration. Their something that reminds them what love is and who they can be. “You never really leave a place you love.